The laugh of the year has been provided by Cardoza Publishing (New York) for the following proclamation: ‘Our philosophy is to bring you the best quality chess books from the top authors and authorities in the chess world’. That incongruously appears in the company’s latest production, World Champion Combinations by – wait for it – Raymond Keene and Eric Schiller. But there is more. Keene, we are solemnly apprised, is ‘considered one of the strongest players in the world’. In reality, he played his last serious chess in the mid-1980s, and on the 1986 rating list he was not among the top ten players in England, let alone the world. Then Eric Schiller is lauded for being ‘widely considered one of the world’s foremost chess analysts, writers and teachers’, though who exactly considers him that is not specified. Schiller ‘has also presided over world championship matches dating back to 1983’. Really? All of them? Some of them? Any of them? Readers may be baffled too as to where a world championship match was held in 1983, but, as will be seen in the penultimate paragraph below, Raymond Keene is on hand to offer corroboration. Either Cardoza Publishing is attempting to deceive the public or it has itself been taken in by the self-flattery of two oversize egos. It all brings to mind the Spring 1998 issue of Kingpin, where Tony Miles debunked a similar dose of Keene bombast from a book which had promoted him as ‘the world’s leading authority on chess and mind sports’ and ‘the winner of 14 separate British championship titles’. As Miles scoffed, ‘that’s 12 more than are generally known about’. 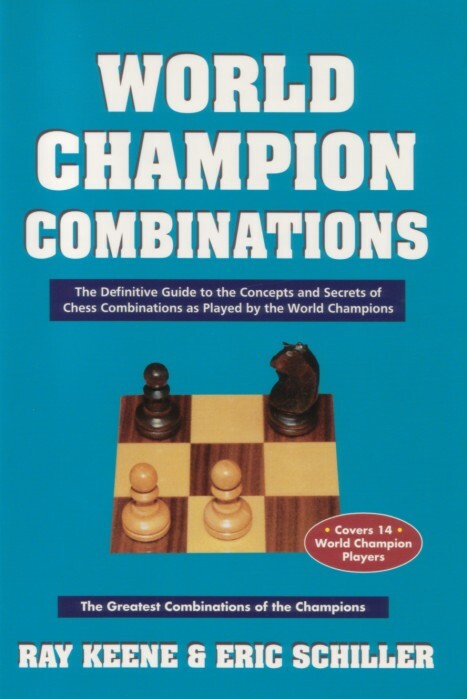 World Champion Combinations goes on to compliment itself on being ‘The Definitive Guide to the Concepts and Secrets of Chess Combinations as Played by the World Champions’, but the only definitive guide offered is to the authors’ incompetence. Each of the champions receives a few paragraphs of introductory generalities, although the ‘Capsule Biographies of Each World Champion’ threatened by the back-cover blurb mercifully never materialize. The announced ‘insightful detail’ on the combinations of ‘the 14 World Champions’ is also left undelivered. Insights are out. Instead we are given a run-through of a small number of the champions’ best-known games and positions of the Morphy-versus-the-Duke-and-Count sort. Putting out such facile material requires minimal knowledge of either chess play or chess history and should at least result in presentation without error. Alas, presenting things without error is not a Keene/Schiller speciality. The reason there are 14 champions is that the co-authors have decided to add on Morphy, who they say was ‘Unofficial World Champion’ from 1857 to 1859. How that can be when it is stated just a few lines later that ‘when he went to Europe in 1858, he was not considered a threat to the great players of his day’ is never explained. One of those ‘great players’ is named as Adolph [sic – Adolf is the correct spelling] Anderssen, but he is omitted from the book, even though another Raymond Keene co-production, the insidious Warriors of the Mind, called Anderssen ‘one of the most brilliant combinational players of all time’. Page 20 of World Champion Combinations puzzlingly says ‘as in the game Kolisch-Anderssen’, as if such a game were included somewhere. The chapter on Tal starts with a heading which reduces the game’s occasion to unintelligibility: ‘Riga Soviet Latvia, 1952’. Throughout the book there are typos aplenty (e.g. ‘suprise’ on page 52, ‘Jonn Nunn’ on page 72), interwoven with the authors’ posits and postulations (e.g. Lasker ‘was not a deep strategist’ – page 44). And so it all staggers on, through to the final game, by Kasparov (the co-authors neglect to say how it ended), and a slaphappy book-list comprising 18 titles. Warriors of the Mind is there, with misspellings of the names of Keene’s co-author and publisher. 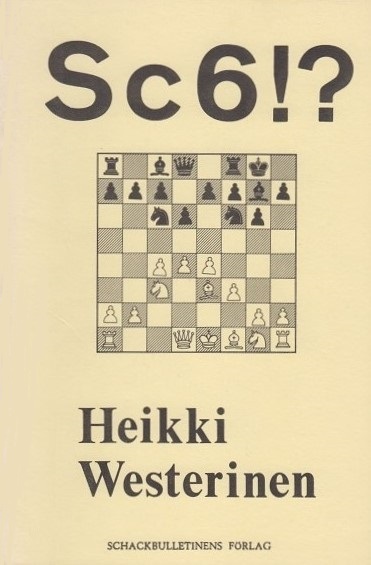 That is the only Keene title to be cited, which helps disguise the fact that whole sections of World Champion Combinations have simply been reproduced, without correction, from previous tomes of his, most notably The Chess Combination from Philidor to Karpov (Pergamon Press, 1977). Now we can understand World Champion Combinations’ mention of a non-existent Kolisch-Anderssen game: in copying from page 56 of the Pergamon book, Keene and Schiller have forgotten to delete a cross-reference that no longer applies. Recycling old trash into new trash is a notorious book-spawning trick of Keene’s, and for this co-production it merely involves changing any uses of ‘I’ to ‘we’. In a Spassky game, another unattributed rehash from the Pergamon book, the pronominal change is duly made on page 167, but overleaf ‘in my opinion’ has been left untouched, and it all descends into farce on page 74 (Alekhine-Reshevsky, Kemeri, 1937). After 23 h3, the ‘I’ has been pluralized (‘Here Alekhine has a note we like very much …’), but unfortunately the quoted words of Alekhine include the remark, ‘I was not a little surprised to read …’. No medals for guessing the upshot: yes, Alekhine’s ‘I’ has also become ‘we’. For good measure, there is another typo (‘to the questioned’) two lines further on in the Alekhine quote. Only Keene and Schiller can make copying look so difficult. The entirety of World Champion Combinations could be demolished in this way, but for the benefit of anyone lucky enough not to have seen the book the best way of showing the extent of the shambles is to pick a complete chapter and to examine every game and position given. Réti-Capablanca, Berlin, 1928. A one-sentence note at move 10 reads ‘White miscalculates and Black won’t be able to take advantage of the exposed queen’. That is the exact opposite of the intended meaning; ‘and’ should read ‘that’. (This time it is a case of unsuccessful copying from page 58 of Schiller’s 1997 companion volume, World Champion Openings.) There is also an inaccurate concluding note. Following 17…Bf3 it is stated, ‘The sacrifice must be accepted, or else …Qh3 is an easy win’. Yet after 18 gxf3, the move 18…Qh3 was indeed played, with such an easy win that Réti at once resigned. Marshall-Capablanca, New York, 1931. A note at move 10: ‘Again, more vigorous is 10 Qc2 as in the game Bogoljubow-Nimzowitsch, Berlin, 1927.’ Not so. A different position had arisen in that game. Capablanca-Souza Campos, São Paulo, 1927. Although it is not specified, this game occurred in a simultaneous exhibition, or ‘in a simulation’ to borrow the abstruse term used by the book elsewhere (page 254). The co-authors do not know that Capablanca’s ‘brilliant’ combination was refuted by Réti in the Morgenzeitung (see pages 121-122 of the April 1928 Deutsche Schachzeitung and page 203 of the Dover edition of The Unknown Capablanca by Hooper and Brandreth). Capablanca-Steiner, Los Angeles, 1933. The co-authors are unaware that this exhibition game with living pieces is not an example of Capablanca’s brilliance but was pre-arranged, as Steiner himself recorded on page 66 of the March 1943 Chess Review and as was reported in C.N. 2037. Capablanca-Fonaroff, New York, 1904. The Cuban did not play this game when in his teens because the actual date was 1918, as given on page 112 of The Unknown Capablanca and many other places. On page 200 of the May 1985 BCM (an item which included criticism of Raymond Keene for other historical blunders) we pointed out that ‘1904’ was wrong. Eric Schiller nonetheless persisted with it on page 17 of The Big Book of Combinations. His mangling there of Capablanca’s games was reported on page 267 of Chess Explorations. ‘Impervious to correction’ was the phrase used above. Capablanca-Mieses, Berlin, 1931. The mistakes here too were corrected in the 1985 British Chess Magazine yet repeated in The Big Book of Combinations (page 27). Firstly, the date should read 1913. Moreover, as also explained in the BCM, ‘the diagrammed position never arose and no combination of the kind indicated was played’. Capablanca-Yates, Barcelona, 1929. To quote one more time from the BCM: ‘Another position which did not happen in the actual game, since Black resigned after 32 f7+. There should, in any event, be a black pawn on a5, not a6’. Capablanca-Lasker, Berlin, 1914. The position did not occur in a game won by Capablanca, but was composed jointly by Capablanca and Lasker (see page 168 of The Unknown Capablanca and any number of other reliable books). In short, not one of the ten Capablanca games and positions given by Keene and Schiller emerges with a clean bill of health. In passing it should be noted that most of the above appeared in Eric Tangborn’s 1994 book Chess Combinations of The World Champions, with similar factual mistakes. It is no surprise that Keene and Schiller put the Tangborn work in their book-list, or, for that matter, that they get its title wrong. What kind of people can show chess, and the chess public, so little respect? Why such illiterati presume to inflict themselves on us incessantly, or at all, is a question that has preoccupied the American openings expert Hugh Myers. A dozen years ago he wrote in CHESS (mid-August 1986 issue, page 241) that Schiller was ‘an assassin of chess history’. That brought forth a pained response from Schiller (September 1986 issue, page 259): ‘I have always researched my facts to the best of my ability’. The number of CHESS readers who fell off their chairs on seeing that one is not recorded, but the following year Schiller showed his true colours. On page 50 of Unorthodox Openings he attempted to exact revenge on Myers, who had written a book on Nimzowitsch’s Defence. Schiller maintained that the best book on 1 e4 Nc6 was not Myers’ but one by H. Westerinen. Despite Schiller’s protestations to the contrary, it emerged that no such book had ever existed. We too had a telling experience, after publishing in C.N. two letters from Schiller. Every word of both was printed, yet Schiller repeatedly put it about that they had been truncated and taken out of context. To refute this, C.N. published them a second time, in the form of photographic reproductions. Schiller’s response? He naturally continued to write that his letters had been truncated and taken out of context. Pressed to apologize, he went silent. But no. The above should be ample to give Cardoza Publishing a belated inkling of the truth. Chapter and verse are available on every point. The remarks by B.H. Wood and Paul Lamford quoted above come from letters which they wrote to us on 17 March 1987 and in March 1994 respectively. For further details about the Unorthodox Openings ...Nc6 matter, see A Sorry Case. Page 11 of Killer Chess Tactics by R. Keene, E. Schiller and L. Shamkovich (New York, 2003) states that the ‘second half of the book is a revised and updated version of World Champion Combinations, by Raymond Keene and Eric Schiller’. The above-mentioned criticisms with regard to Capablanca v Souza Campos also apply to the game’s treatment on pages 15-17 of Taming Wild Chess Openings by John Watson and Eric Schiller (Alkmaar, 2015), a book which, moreover, gives the venue as ‘San Paolo’. See too An Alekhine Blindfold Game. Latest update: 4 June 2015.